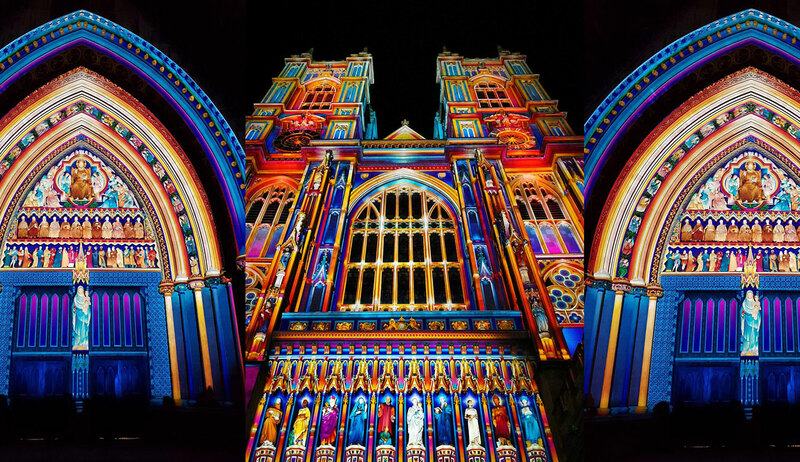 Lumiere returned to London again this year, on an even bigger scale. Installations were placed throughout the heart of London covering areas from King’s Cross to Waterloo. As lighting designers in London, we were bursting with excitement to see installations from returning artists that we love, as well as checking out what’s new for 2018. Plus, the festival offered a rare opportunity to walk on London streets car-free! One of the highlights of this year festival, Waterlicht is a fascinating light installation with an intriguing underlying concept. The installation was originally created for the Dutch District Water Board Rijn & IJssel to represent a ‘what-if’ scenario: what if the city Amsterdam got flooded – how high the water level would be? The installation is created out of the simple (but articulate) combination of smoke and laser light. 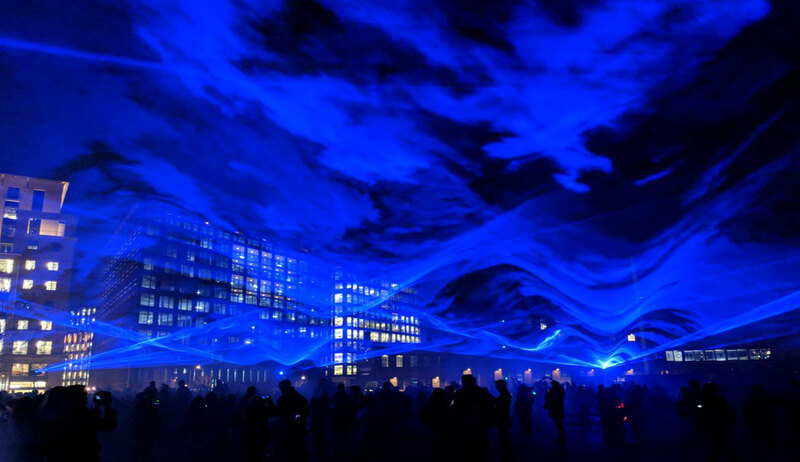 Commissioned for Lumiere London, this installation mesmerised spectators and turned Granary Square into an underwater world. Aether is designed to amaze people and trigger emotions. This installation captivated the crowds with a 3-dimensional light lattice that moves in sync with cinematic soundscapes created by Max Cooper. This interactive installation by Daniel Iregui drew quite a lot of attention from passers-by. The installation was actually a black box with pixelated graphic screens. The pattern on the screen changes sequentially paired with soundscapes. The installation invited passers-by to interact with the screens providing a lot of fun when the light movement on the screen followed hand gestures. This is the second year that Warrener has (virtually) painted the façade of Westminster Abbey, thus the name ‘Chapter 2’. The ‘projection mapping’ technology might be his paintbrush but his real secret weapon is the high level of attention to detail. Not so often can you see the martyrs statuettes come to life as much as they do with the help of Warrener’s work in Lumiere. We would have never thought an installation focused on sustainability could be so much fun! 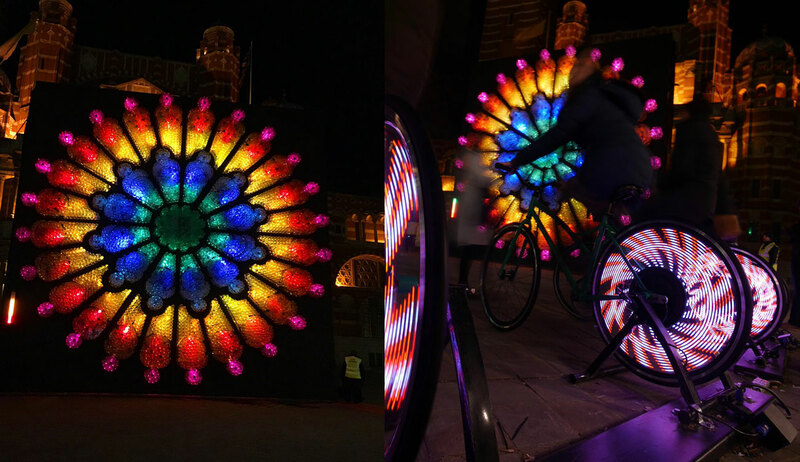 The installation, made out of plastic bottles, was illuminated only if members of the public join force in creating the electric power…by pedalling bicycles! If there was a small amount of power produced, but not enough to light the whole artwork, the artwork would be only partially lit. Some orchestrating was required from time to time to make sure that all visitors (although, not just visiting anymore) were pedalling hard at the same time so that there is enough power to light up the whole artwork. We love to think that this is also an underlying message that every person is accounted for working together toward the era of alternative technology. Lumiere London returned in 2018 as a much bigger festival than the original in 2016 and included a wide range of installations from projection mapping, light and sound, to interactive artwork. With all the fun light installations amidst the backdrop of our beloved city, this was an occasion to see London in a ‘new’ light. The festival has now become one of the most anticipating events in London, we already can’t wait for the next one!